For over 85 years Cap's Place has been known for fresh native seafood, hearts of palm salad, succulent steaks, chops and chicken. Cap's extensive selection of fish and shellfish dishes offer the very best in casual waterfront dining. Our menu includes only the freshest local dolphin, wahoo, cobia, snapper, pompano, lobster and stone crab, varying with the catch. Take our boat to South Florida's premier waterfront restaurant - Cap's Place. Get a taste of local history along with outstanding fresh seafood. Recognized as a national landmark Cap’s is Broward County, Florida's oldest restaurant. With roots as a 1920's casino and rum-running speakeasy, it sits on an island off Lighthouse Point and can only be reached by Cap's motor launch. Cap's location halfway between Miami and West Palm Beach on the intracoastal waterway makes a trip to the secluded coastal pine and pecky cypress landmark a must for anyone visiting South Florida and the Gold Coast. 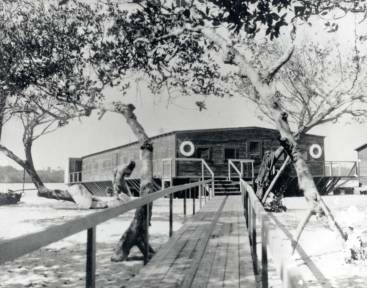 Back in the 20's in No-Man's Land Florida, Cap Knight, Lola Knight and Al Hasis brought together a group of wooden shacks attached to an old barge which was floated up the present day intracoastal waterway from Miami to its location on Cap's Island near the fabled Hillsboro lighthouse north of Fort Lauderdale. This was a rum-running restaurant and gambling casino, nestled on an island in the coastal marsh. For over seven decades Cap and Lola Knight, Al and Patricia Hasis, and now their children Tom, Ted and Talle Hasis, have served up only the finest of seafood in South Florida's most unique waterfront setting. Among some of the notables who have enjoyed Cap’s creative cuisine are Franklin D. Roosevelt, Winston Churchill, the Vanderbilts, the Rockefellers, Al Capone, Meyer Lansky, Casey Stengel, George Harrison, Errol Flynn, the Temptations, Susan Hayward, Gloria Swanson, Mariah Carey, "Norm" from TV's Cheers and Joe Namath. Cap's has hosted the famous and infamous for decades. The winner of numerous dining awards, in 1990 Cap’s Place was listed as a historical site on the National Register of Historic Places. Enjoy South Florida ... "like it used to be!" Take our motor launch from Cap's dock located next to Lighthouse Point Yacht Basin & Marina (8 miles north of Fort Lauderdale). To reach Cap's dock turn east 2 blocks north of Copan's Rd & US-1 (N. Federal Hwy) at U.S.-1 & NE 24th St. Follow the double lines and signs on the curvy road as you go toward the Yacht Basin. or watch the boats sail by under a gentle ocean breeze from our open air patio. Public parking for 150 cars is available adjacent to our dock. Please review our directions page for parking information. and HIGHLY recommended on weekends and holidays. PLEASE NOTE: ONLINE RESERVATION SYSTEM IS NOT MONITORED AFTER 3:30 p.m.
(954) 941-0418 after 5:00 p.m.
Open Tuesday thru Sunday from 5:30 p.m.
Our Telephone number is 954-941-0418 if you get the recorder before 5:00 p.m.
the recorder does not take messages! For Online Reservations please go to our Reservations page Thank You!! This page was last updated on 12/19/16.